As a valued customer, you’ll already know that Biologi is built on three fundamental principles. Provide consumers with a range of 100% active plant serums that respect the integrity of natural ingredients. Create transparency across the skincare industry so that consumers can make informed choices about the products they use on their skin. Remain fluid in our operations to respond to the needs of the consumer and continually develop our products and processes to exceed expectations. 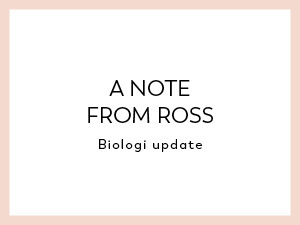 As the benefits of using Biologi become more widely known, Biologi is now stocked in more retail outlets across Australia meaning I’ve had to undertake an urgent review of storage conditions of the serums. So that Biologi can continue to honour all pillars of our promise to our customers and make sure each bottle of serum reaches you just as it left the plant, we’ve been left with little choice but to add a small amount of preservative to our serums to remove the potential risk of contamination issues. From October 8, all bottles of Biologi serum may contain the preservative sodium benzoate added at 0.2%. I haven’t taken the decision to add a preservative lightly. I’ve chosen the preservative that does not contribute to sensitised skin and have added it at the smallest percentage for it to still preserve the natural plant extracts while not compromising the results that Biologi delivers. Adding a small amount of preservative to your serums will destroy cells of bacteria, fungi and yeast and keep the natural actives intact for longer to ensure that you, our valuable customer, achieve the same great results, without reducing the efficacy of the natural phytonutrients in the product. PS. You can read the full dossier on sodium benzoate published by the World Health Organisation here.